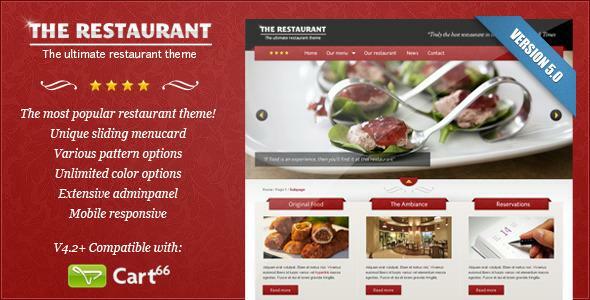 The Restaurant e-Commerce Theme.The restaurant store. This theme is now mobile responsive! We’ve also added some other much requested features! Get it while it’s hot! Check the update history at the bottom for more information. This WordPress theme is a slick and highly customizable theme for restaurants and anything alike. Change colors with a colorpicker, simply switch the layout and add your own sliding menucard to impress your customers! This theme can quickly be turned into an eCommerce website thanks to the build-in Cart66 plugin support. Sliding menu card page to show off your products with price and description! Multiple menucards are now possible! Use the cart66 ecommerce plugin to sell your products online! Share the post "The Restaurant"